My archive image this week is Lewis Hine's famous picture "Power House Mechanic Working On Steam Hammer". 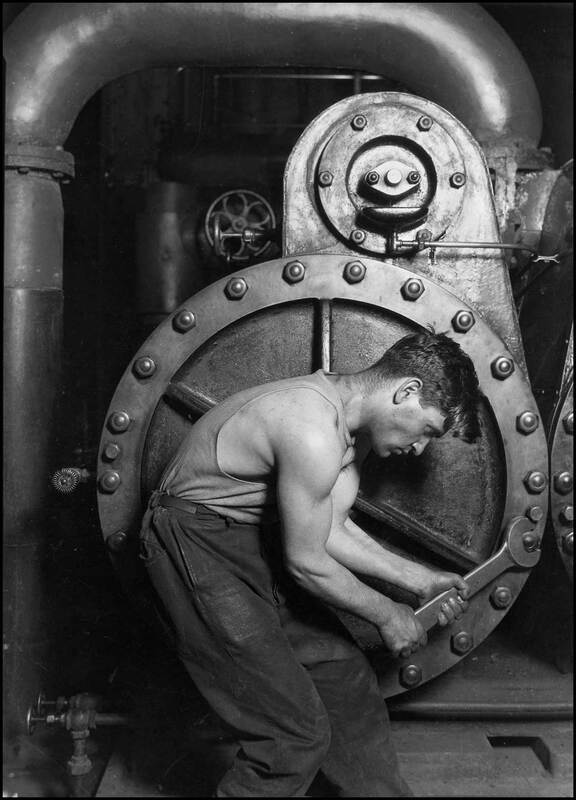 Taken in 1920 and now part of the collection of the US Work Progress Administration and freely available via the WikiMedia Collection, the image perfectly captures that almost cursed synergy that was seen to exist between man (and woman) and machine in the 1920s and can also be seen in films such as Chaplins' masterpiece "Modern Times". For the "themers" amongst Sepia Saturday regulars there is plenty to be working on, for those who are following a theme of their own, it is something to look at and admire whilst they link their own contribution. Sepia Saturday 68 will be on or about the 2nd April 2011, which I suppose is anytime between now and next Sunday, so get working. My archive photograph this week is full of activity and full of detail. 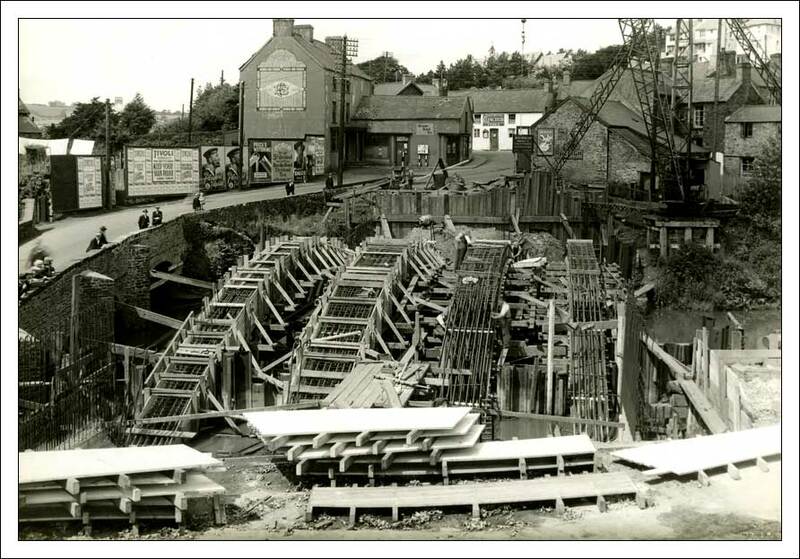 The photograph dates from the mid 1930s and shows the reconstruction of the bridge over the River Loughor at Pontardulais in Wales. It is taken from one of the copyright-free collections shared by the British National Archives with the splendid Flickr Commons initiative. For the "themers" amongst the Sepia Saturday participants there are a wealth of prompts available. For the "memers" just enjoy the image as you choose your own old photograph. In either case, post your contributions for Sepia Saturday 67 on or around Saturday 26th March 2011. There have to be some perks for the poor old devil who administers the Sepia Saturday Blog and one of the main perks is that I get to choose the weekly archive photograph which accompanies the call for posts. Those who know me will be not in the slightest surprised to see a pub featured. 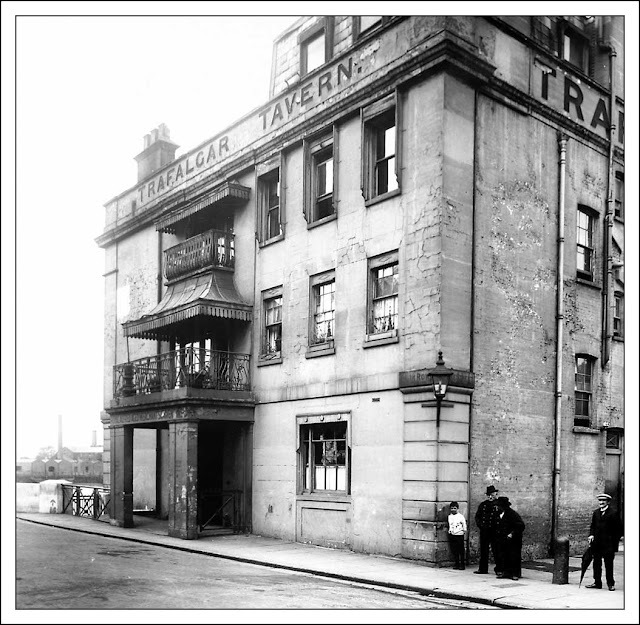 The pub in question is the Trafalgar Tavern in Greenwich and the photograph - which comes from the collection of the British National Maritime Museum - was taken in 1912. The pub, which was built in 1837, still stands today and is now a very plush establishment indeed. Naval battles, pints of beer, shabby old pubs - there is plenty for the "themers" to work with for Sepia Saturday 66. But remember, you don't have to follow the theme. All you need do is to share your old photographs with the rest of us by posting on or near Saturday 19th March 2011 and linking your post to the Linky List below. If you are new to Sepia Saturday take a look at the brief explanation below, if you are an old friend all you need do is post, link and comment. Cheers! From the Steinfeldt Photography Collection of the Jewish Historical Society of the Upper Midwest. Some people enjoy looking for themes in my weekly archive image, some people choose to go their own way. With Sepia Saturday it doesn't matter because it is the image that counts. 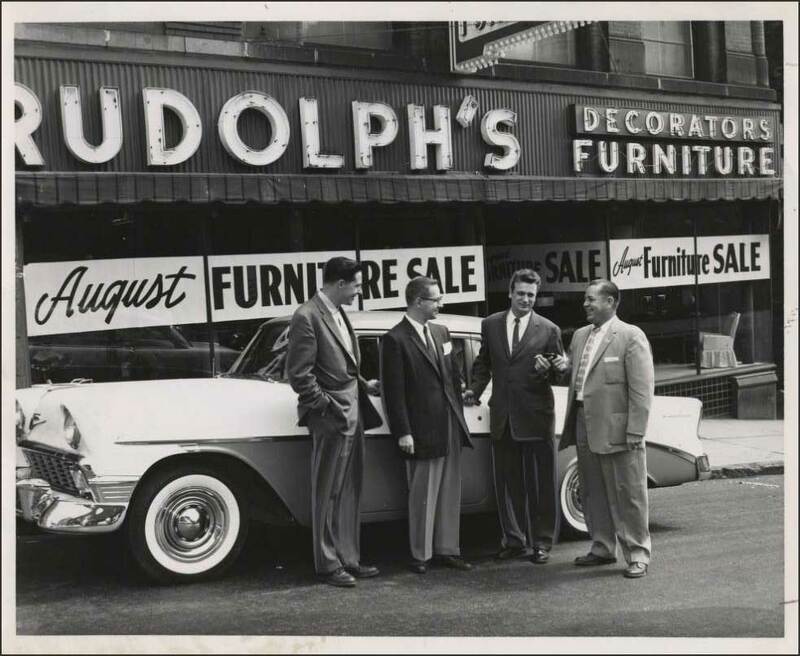 And the images don't have to be very old and they don't have to be in sepia - the above photograph which shows the furniture store of Leonard Rudolph in Duluth, Minnesota, is neither. I have to confess that until today I had no idea where Duluth was and only a vague concept of where Minnesota was in the great scheme of things. But now I am intimately familiar with a storefront in Duluth at a moment in time in 1956. I have a snapshot of the lives of four people and a visual thesis on the American motor car industry in the mid twentieth century. Make no mistake about it : images are powerful toys to play with. Share the power of your old images by taking part in Sepia Saturday 65 which will take place on or around Saturday the 12th March 2011. I half promised Dakotaboo last week that I would try and find an archive shot that he could use as a theme in order to post something about his recent holiday in the British Peak District. 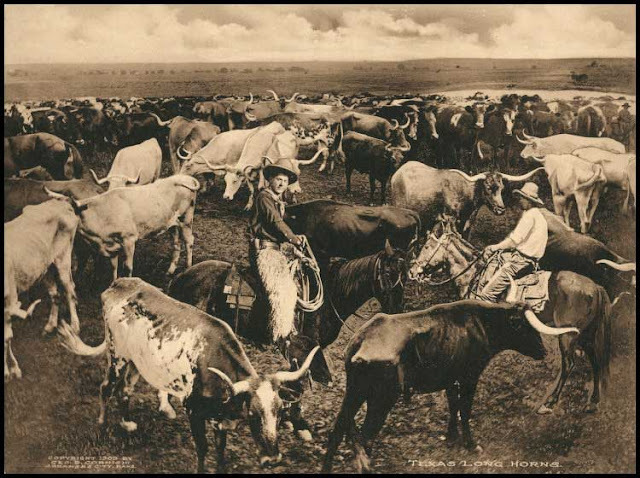 Now I know that Texas is not in Britain, and that the Peak District does not have large herds of longhorn cattle, but liberal interpretation has always been the order of the day here on Sepia Saturday, so do with this image from Southern Methodist University Library what you will. Sepia Saturday 64 will take place on or around Saturday the 5th March 2011. We seem to be having more and more newcomers to Sepia Saturday and, I have to say, they are most welcome. For the benefit of newcomers, I thought it might be useful to incorporate a summary of what Sepia Saturday is all about and how it works with each weekly call. Regular contributors can skip this and move directly to the Linky List.